Thomas (“Tom”) Jones is a distinguished professional with over 30 years of experience in leveraged finance, investment banking, business operations and workouts / restructuring. He is currently a Managing Director at leading restructuring and due diligence advisory firm, Alvarez & Marsal (A&M). Highlights of his career at A&M include leading the liquidation of Lehman Brothers’ $14.5 billion portfolio in Asia. Prior to A&M, his distinguished career at JP Morgan includes Head of Corporate Lending in the U.S., a member of the Credit Policy Committee and Head of four industry groups within Mergers & Acquisitions. As a strategic personal investor and Senior Advisor, Mr. Jones assists Star Mountain and its portfolio companies with advice and relationships to help build and protect value. He also further strengthens Star Mountain’s existing and valued relationship with A&M. Mr. Jones has had a distinguished 30-year career in investment banking. He spent 20 years at JP Morgan, where he initially specialized in leveraged lending. Mr. Jones completed the firm’s first leveraged buyout (LBO) loan and private equity investment, a financing which led to the creation of JP Morgan Capital. He later became head of Corporate Lending in the U.S. and a member of the firm’s Credit Policy Committee. Mr. Jones then joined the M&A Department and became head of four industry groups – telecom, media, high-tech, and aerospace/defense, with responsibility for both investment banking and M&A. He later worked at both Salomon Brothers and Credit Suisse First Boston, where he had senior investment banking coverage responsibilities. Mr. Jones graduated with high honors from the University of North Carolina at Chapel Hill (UNC). He started his career at Procter & Gamble and then returned to UNC to earn an M.B.A. from the Kenan-Flagler School of Business, where he later served on the Board of Visitors for fifteen years. 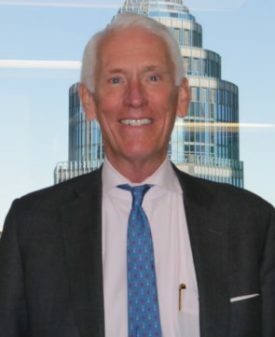 Mr. Jones completed the Corporate Finance Management course at Harvard Business School in 1986 and later was a guest lecturer at both Harvard’s Advanced Management Program and the Kenan-Flagler School of Business. Mr. Jones earned a master’s degree in American Studies from Columbia University and is an instrument-rated pilot. Mr. Jones has served on the Board of Visitors of UNC, the boards of both Outward Bound U.S.A. and New York City Outward Bound, and the board of the Gladney Center, the nation’s oldest adoption agency. Mr. Jones currently serves on the board of Camplex, Inc., a private medical equipment company, and is a member of the board of The National Humanities Center.